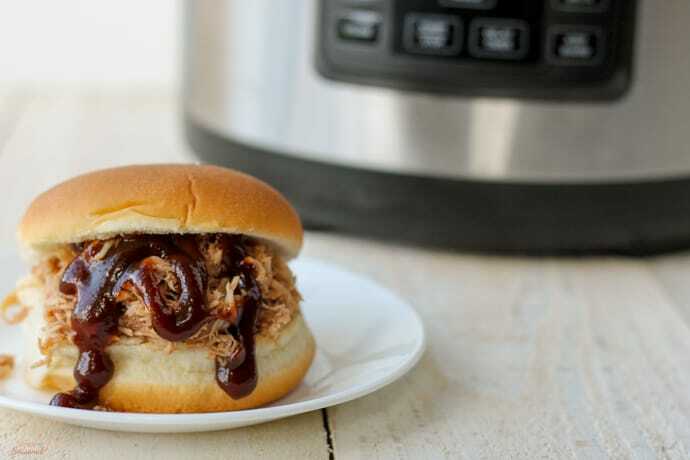 Cook meat for BBQ sandwiches, nachos, quesadillas or even pizza in a fraction of the time with this Crockpot Express Pulled Pork recipe! 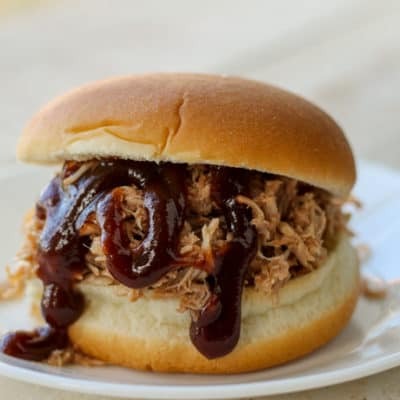 We eat BBQ pulled pork sandwiches several times a month. Pork roasts are cheaper than beef, and it’s a meal my kids will gladly eat over and over. Plus, we use the leftovers for other things like pulled pork nachos, quesadillas, and even pizza! Since I’ve been experimenting with pressure cooking lately, I had to try Crockpot Express Pulled Pork. 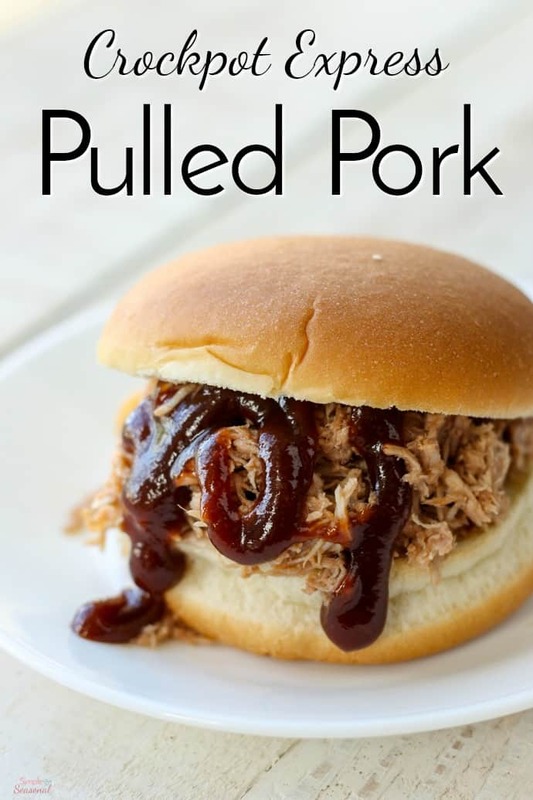 This one is definitely getting added to my favorite Crockpot Express Recipes! Normally, I cook pork roasts in my slow cooker, but sometimes (more often than I care to admit) I forget to pull the meat out of the freezer in time. Or I have the meat thawed, but I just forget to actually put it in the slow cooker so it will be done in time. That’s when the Crockpot Express comes in handy! <—-click there to see it on Amazon if you don’t already have one of these wonderful machines. I can cook a whole roast, even if it’s frozen solid, in one hour! Cut the roast into equal sized pieces. A 2 pound roast can cook without being cut down, but a larger roast will cook better if cut in half or fourths. Rub with salt and pepper. If desired, brown the roast on Brown/Saute setting for about 3 minutes per side to deepen flavors. Press Start/Stop after browning is done. For plain pulled pork, pour in 1 cup of stock and then add the roast. Close and lock the lid, turning the steam release valve to closed. Cook on Meat/Stew (high pressure) for 60 minutes. 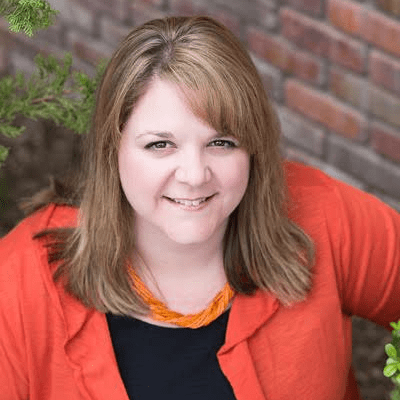 Allow a natural pressure release of at least 15 minutes. Remove from the pot to a bowl and shred with two forks. Mix 1 cup of BBQ sauce with 1/2 cup of water and pour into the pot. Add the roast chunks. Close and lock the lid, turning the steam release valve to closed. Cook on Meat/Stew (high pressure) for 60 minutes. Allow a natural pressure release of at least 15 minutes. Remove from the pot to a bowl and shred with two forks. 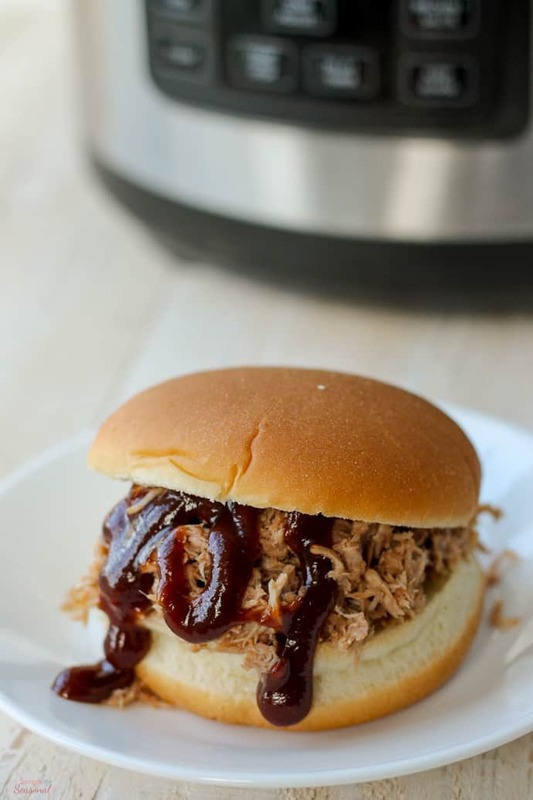 Stir in the remaining cup of BBQ sauce and serve on rolls or buns. I have cooked a frozen 2 pound roast with these settings. It takes longer to come to pressure than with defrosted meat, but the cook times are the same. I would not try to do a frozen roast any larger than that without adding more cook time. For best flavor, use defrosted meat. It's easier to season and it cooks more evenly. For shredded pork for tacos, quesadillas, nachos, etc use taco seasoning instead of just salt and pepper! Add a squirt of lime juice or cook in orange juice for carnitas. As you can see from the recipe card above, there’s a lot of different things you can do with a pork roast! To be totally honest, I still prefer the depth of flavor that you get from slow cooking a roast. 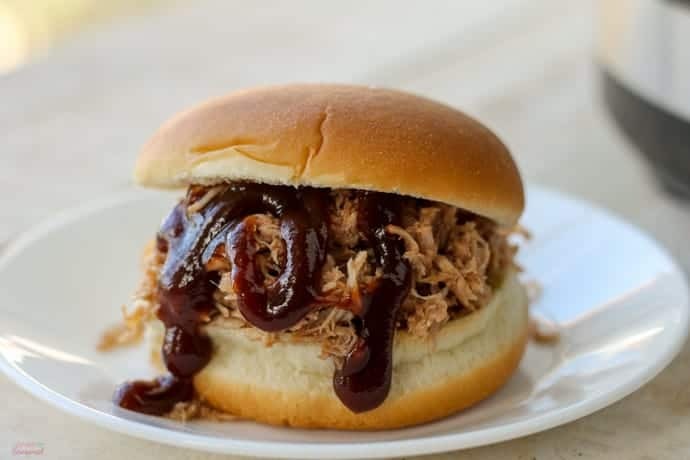 However, it’s not always possible to cook for 8 hours, so my Crockpot Express Pulled Pork is an awesome trick to have up my sleeve! I just got a Crock Pot Express Pot and I have a Pork SHOULDER with bone in. It is about 5 lbs. 40 oz. How long would u cook it? Sorry for the late reply! I’ve been out of town for spring break. Did you find an answer to your question already?